You’ve checked in and settled into your Southwest hotel. After scanning the T.V. for your favorite channels, do you really want to spend all of your free time as a lounging lizard? Of course, not! You want to be as spry as an agile road runner. If you’re vising the Southwest for the first time, you’ll quickly notice the expansive vistas. The bright outdoors are perfect for a brisk morning walk, a strenuous hike or a bike ride that challenges, even, the most sturdy bike enthusiast. Exercise, of all types, has health improving benefits. This includes reducing heart disease, lowering blood pressure, improving diabetes and even preventing certain cancers. Most hotels have a fitness room with basic cardio equipment. In addition, there are simple effective exercises that you can do within the confines of your indoor space, especially on the rare occurrence of rain while visiting the sunny Southwest. High Intensity Interval Training (HIIT) is the most effective fitness routine for improving both endurance and strength. Here is a simple routine that you can do at home or while on the road, in less than 30 minutes. Start with sets of 10 each. Move quickly between each exercise. 10. Prayer Pose to honor your body, the gift of movement and good health. It is the earth that nourishes and sustains our physical well-being with vital nutrients that are necessary for our survival. Without plant-life, human existence as we know it will cease. As we come to this realization, it’s easy to understand food as medicine is an integral part of our optimal health. Honor the earth. Bless your body. Eat more veggies! You can find more at the Physician’s Committee for Responsible Medicine (PCRM.org) where, like myself, physicians teach their patients and not just treat them. Insist that your doctor does the same. Here you’ll find simple and delicious plant-based recipes, for the whole family to enjoy....and that help you heal. ​Let Food Be Your Medicine! This colorful, crunchy salad is perfect with Mexican food or any other spicy cuisine. It can be made in advance, as it keeps well. 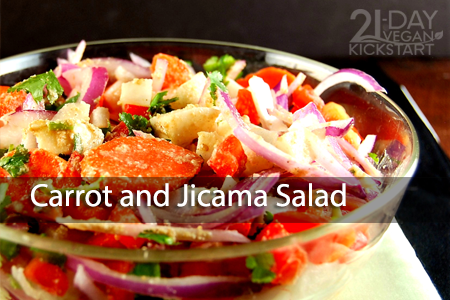 Combine carrot, jicama, bell pepper, onion, and cilantro, if using, in a salad bowl. In a separate bowl, combine vinegar, lemon juice, and Sesame Seasoning. Add to salad and toss to mix. 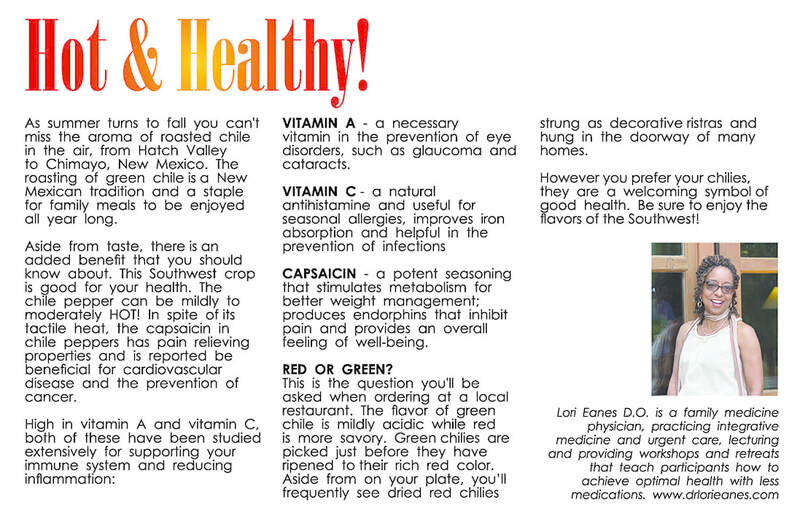 Source: Healthy Eating for Life to Prevent and Treat Diabetes, by Patricia Bertron, R.D. ; recipe by Jennifer Raymond, M.S., R.D. 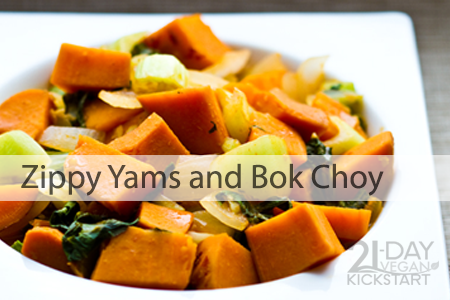 The chili paste, lemon, and garlic give this recipe a delightful zip which is a welcome way to eat nutrient-rich vegetables like yams and bok choy. Put yams in a deep skillet and just cover them with water. Cover skillet and boil yams for 5 to 10 minutes, until soft when pierced with a fork. Add onion and garlic and continue to simmer until about half of the water has boiled away. Add vegetarian Worcestershire sauce, chili paste, and bok choy. Simmer until bok choy is soft. Sprinkle lemon juice over the mixture and serve. Source: Amy Joy Lanou, Ph.D. 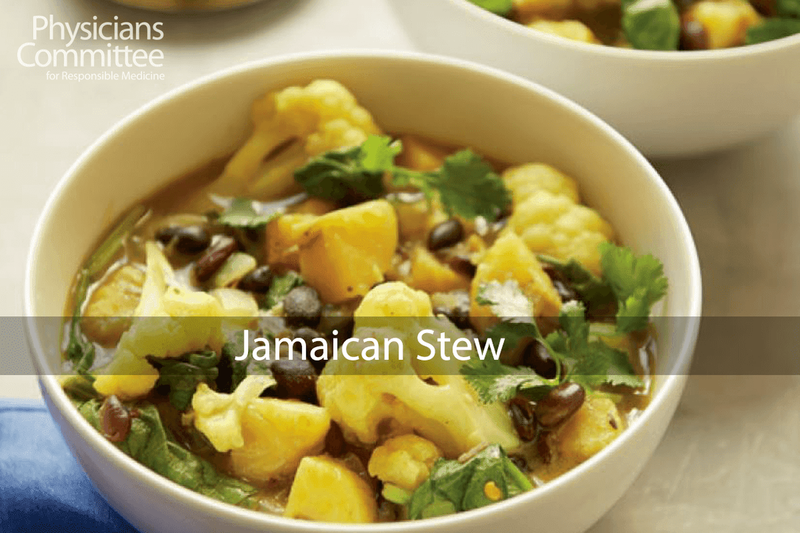 This hearty stew combines earthy spices with a gingery kick and a pop of lime. The combination is delicious! In a large pot over medium or medium-high heat, combine the onion, plantains, salt, coriander, cumin, turmeric, thyme, allspice, red pepper flakes, and a few tablespoons of the coconut milk. Cook for 6 to 7 minutes, stirring occasionally. Add the water, beans, cauliflower, ginger, and remaining coconut milk. Increase the heat to high to bring to a boil, then reduce the heat to low, cover, and cook for 12 to 15 minutes, or until the plantains are cooked through. Add the lime juice, spinach, and cilantro (if using), and stir just until the spinach wilts. Serve immediately, with the lime wedges. Note: When plantains are less ripe (more greenish), they are less sweet and taste somewhat like a potato crossed with a yellow sweet potato. For this recipe, use plantains that aren’t green but that aren’t fully ripe (with too much brown) either. Also, while they look like bananas, plantains cannot be peeled like bananas. Instead, trim the ends and then use your hands or a knife to loosen and pry back the peels. 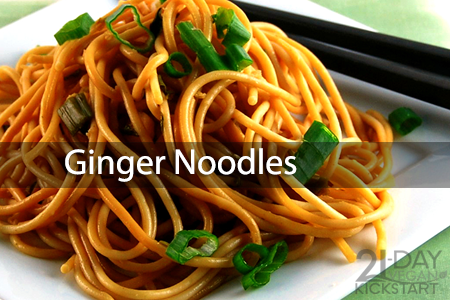 These delicious noodles are surprisingly easy to prepare. Cook noodles in boiling water according to package directions. When tender, drain and rinse. Mix vinegar, soy sauce, ginger, garlic, jalapeño pepper, green onions, and cilantro, if using, then pour over cooked noodles and toss to mix. 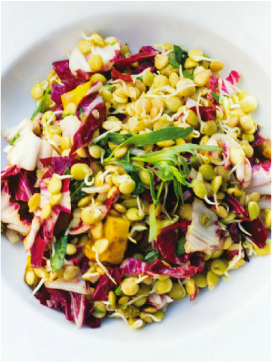 For this recipe, you will need to pop the amaranth, which is a lot like popping popcorn! To pop your amaranth, heat a pan over medium-high, put 2 tablespoons of amaranth in the pan and cover, shaking the pan above the flame until it pops. In 10 to 15 seconds you'll be done with your first batch. Chop all fruit in chunks (except banana) and mix well. 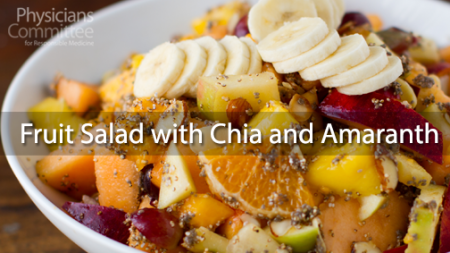 Sprinkle with the sliced almonds, chia seeds, and popped amaranth, mixing again to make sure all fruit is coated. Top with sliced bananas. For each issue of edible, we test every recipe to make sure it will work in your home kitchen. Not only does this mean we present you with quality, easy-to-make dishes, it also means our team spends a really enjoyable day in the kitchen together doing what we love best, cooking. During this test kitchen, we invited special guest, Dr. Lori Eanes to join us to talk about food as medicine. We met Eanes during one of our KASA 2 Morning Show visits, and instantly hit it off as fellow food-lovers. Over a lunch which included all of the following salads, we discussed ideas of preventative medicine through dietary and behavioral changes. Eanes’ motto is “more healing, less medicine”; the best treatment for disease and chronic conditions is to avoid them in the first place through better self care. She also promotes integrative medicine, which treats mind, body, and spirit by combining conventional western medicine with alternative or complementary treatments, such as herbal medicine, acupuncture, massage, and stress reduction techniques. She believes that many practitioners are experts in disease, but not in disease prevention. Eanes currently splits her time between freelancing in urgent care facilities in Albuquerque and developing an out-of-the-box practice that focuses on teaching prevention and self-advocacy through workshops and seminars. Much of what she teaches focuses on the power of food for health. As an urgent care doctor, Eanes often sees patients when they are experiencing intense stress, but she recognizes how much stress people carry in general. She believes the biggest factors for change in health, for good or bad, are diet and behavior, and both are related to stress. Behavior change is hard, and often causes stress. According to the American Psychological Association annual report “Stress in America,” two out of five people report overeating or eating unhealthy food as a way to cope with stress. In essence, breaking a cycle of bad habits associated with bad food can be very hard without support and serious intention. “Keep it simple,” Eanes says, referring to how we live in a culture of increasing distraction. She advocates mindful eating and simple foods as a way to help build consumption awareness. “Our sympathetic nervous systems are overloaded,” she reflects. “We are so distracted by media and technology, it’s easy to lose track of our inner compass.” For her, health is also about self-awareness and mindfulness, particularly when it comes to food. During her workshops, she also conducts exercises in mindful eating, asking participants to consider taste, texture, aroma, and to slow down and take time to chew each bite. According to the website RxList, the third most prescribed drug in the US is Nexium, a heartburn relief medication, and, according to Eanes, this has everything to do with the food choices people make and the way they eat. Finally, Eanes says, if a person wants to change, he or she must have goals. If you’re ready for some serious reflection about getting healthy, changing your eating habits, and possibly appreciating food more, consider joining Eanes for her workshop “Do as the Doctor Does” at Sunrise Springs on June 24. You’ll find engaging presentations, healing treatments, simple stress management techniques, fitness activities, and spa cuisine. Then, when you get home, these salads can inspire meals that help you work toward your goals and a renewed, healthier you.